There has been a dearth of good nonfiction lately. So much so that this is probably the first book I’ve read in four or five months, which is a long time for me. But I’ve been waiting for Laura Hillenbrand’s new book ever since I first heard about it a few months ago. I even went against my personal stance on e-book pricing and paid $12.59 for the Kindle version. I don’t regret my decision. The main driving force of any good story is conflict. And this story seems to have a never-ending supply of it. Just when you think things can’t get any worse for poor old Louis Zamperini — it does. A lot worse. This is one of those stories that if it were fiction readers would be complaining about the believability of the story. Who writes about sharks jumping out of the water and lunging themselves at survivors of a plane crash? Or spending some two months at sea in a raft, nearly starving to death, only to have the first aircraft to spot you turn out to be a Japanese bomber who decides to strafe you. In fiction it would be laughable. But when these events actually happened, it takes on a whole other level of significance. 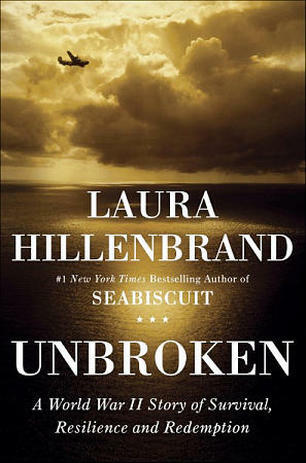 In the acknowledgments, Laura mentions that she didn’t think she would ever find another story as compelling as Seabiscuit. I know exactly what she means. But the truth is that there are stories out there to be told. I happen to be writing this review on the 69th anniversary of Pearl Harbor. It was this event that derailed Louie’s plans and aspirations and led him into the military. I couldn’t help think about the many stories I’ve read over the past ten years or so related to World War II. When Laura talks about the poor souls on Wake Island, I remember reading a book about the capture of that island and the fate that awaited those who survived. While Louie was suffering in a Japanese prison camp, being tormented by a sadistic guard, there were thousands of equally compelling stories going on all around him. Men were disappearing into the ocean. Fighting battles on pieces of rock. And languishing in prisons just like Louie. The point is that, unlike everything you’ve ever heard about writing, you don’t have to always write about subjects you are an authority on. Laura didn’t let the publishing world force her into writing another book about horse racing. She found a compelling story and decided to tell it. But even a great story needs a great story-teller. And Laura Hillenbrand is a great story-teller. By the time Louie and his fellow prisoners are freed at the end of the war, you feel as though you have completed one hell of a book. But the story isn’t over. There’s so much more to tell. These are real people. Real heroes. Real villans. You want to know what happens after the war. You want to know what happens to that sonofabitch Watanabe. One sign of a good book is when as you are reading it you are transported to the place and time you are reading about. That happened with this book. I’d be reading about Louie and Phil out in the Pacific on their bullet-ridden raft and suddenly be dying of thirst. Or I’d be reading about life in a Japanese prison camp and all of a sudden have hunger pains. Then there were the stories within stories told through the footnotes. The publisher decided to not use numbering for end notes, so those were un-accessible for me on the Kindle. But there were plenty of footnotes sprinkled throughout. One that really got me thinking came at the time Louie was about to board a plane leaving Japan. He was hesitant when he learned that the plane was a B-24, the same type of plane he had crashed in. The plane was overloaded and barely made it off the ground. In a footnote Laura tells of two planes that were not so lucky. One disappeared in the ocean. The other crashed on takeoff and killed everyone on board. To think of having gone through the hell of war and life in a prison camp only to end up dying as you’re finally heading home. You see. There are stories out there. Now if one would just fall into my lap.